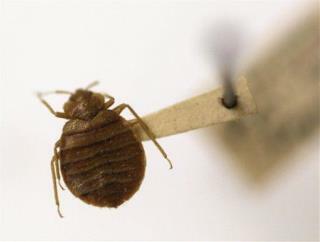 (Newser) – Here's some bad news for anyone who lives by the credo the only good bedbug is a dead bedbug: The nocturnal bloodsuckers that infest homes, hotel rooms, and even movie theaters are getting harder to kill. In a study in the Journal of Medical Entomology, researchers say that bedbugs collected from Cincinnati and Michigan—where a man recently lit himself on fire in his quest to vanquish the pests—showed "dramatic levels of resistance" to the most commonly used insecticide in the world, the BBC reports. Lead researcher Alvaro Romero of New Mexico State University says the results don't necessarily mean that bedbugs worldwide are resistant to neonicotinoid insecticides, but they suggest that using chemicals to control bedbugs is a losing strategy in the long run. "It's a very complex problem," Romero says. "We need to incorporate other alternatives." Based on personal experience, the best way to deal with bedbugs is to starve them by isolating your bed. Pesticides of all stripes are expensive, potentially harmful, and (as the article notes) not particularly effective. Buy a roll of painter's plastic -- wide enough to cover you mattress with plenty hanging over the sides (or duct tape two sheet together). Cut to length. Drape over your mattress then put on a fitted sheet over it. Any bedbugs on your mattress can't get through the plastic, and any bedbugs elsewhere in the room can't climb the plastic. You may need to remove headboard/footboard so that the bedbugs don't have something to climb up, and you definitely need to move the bed away from walls. Costs less than $20 per bed.. The answer is as simple as it is environmentally friendly. BRING BACK DDT!! The false claims against DDT were debunked even as the EPA was banning it. It was the EPA's first attempt at banning a substance & they were going to be damned if they were going to change their minds & look weak (the head of the EPA at the time was a former leader of a group that wanted to ban it). The death toll by that one idiot & the EPA in general from causing mass hysteria over an extremely effective & inexpensive pesticide is in the millions! DDT was the reason generations grew up believing bed bugs were a myth, "don't let the bed bugs bite" was just silly goodnight saying to children. Unless you are a bug or have an exoskeleton you cannot be harmed by DDT unless you practically drown in the stuff.